From reports of extreme weather events to America’s withdrawal from the Paris agreement, climate change has rarely been out of the news in the last year. 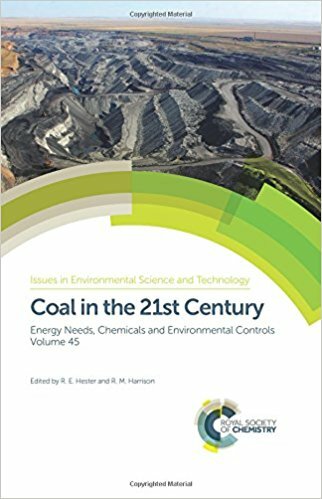 As much of the historical rise in carbon dioxide levels has been attributed to the burning of coal, particularly in Europe and the USA, and a large proportion of future emissions, particularly in China and India, are expected to come from coal fired power stations, Coal in the 21st Century is a timely publication. Covering a wide variety of topics, it is a combination of papers from authors based in the US and UK edited by R. E. Hester and R. M Harrison. The opening chapter by Liam McHugh from the World Coal Association discusses the likely future of coal within the wider context of power generation. Included is an overview of improvements in efficiency and emissions from newer coal fired power stations that incorporate carbon capture and storage (CCS) technology. The role of coal in lifting developing countries out of poverty is emphasised, although the author’s optimism about the likelihood of emissions reductions even with coal included in the energy mix is not repeated in the following chapters. The next two chapters discuss the process of mining and the technologies in coal fired power stations in more detail. Chapter two describes the different types of mine, the equipment used for extraction and transportation and the associated environmental impacts. A short section about novel methods of extraction was interesting, but overall this chapter would have benefitted from some better editing and more details about the economic and environmental impacts of coal production around the world. The third chapter focuses on power station equipment and includes some illuminating examples of the trade-offs required with newer, more efficient technologies. For example, India’s supercritical and ultra-supercritical coal fired power stations are unable to consume its domestic coal, and will therefore have to rely on increasing coal imports despite an increasing domestic supply. According to the authors of this chapter, in order meet the requirements of the Paris agreement and limit warming to 2°C over the course of the 21st century, both existing and new build coal fired power stations will become stranded assets before the end of their expected operational lifetimes. The chapters on health and regulation are mainly drawn from examples from the US, but they do contain a lot of information. The health impacts from all aspects of the process, including mining, processing, transportation and burning, are all considered. Of particular note was the longevity of some of the pollution and the size of the issue. Waste from mining and coal fired power stations are the two largest US industrial wastes; the elemental nature of toxins from coal waste means that they persist in the environment indefinitely. Both these facets combine to cause significant health problem in areas where there is an economic reliance on coal. The Clean Power Plan, SO2 cap and trade and mercury regulation are discussed in chapter five. Disappointingly, given the amount of coal being burned in India and China, there was only a short section on regulation in these two countries— cap and trade in China and taxes in India— but there was no follow up in the chapter as to whether these are successful and sustainable. The final two chapters of the book cover more technical aspects of coal use, including direct and indirect liquefaction and the holy grail of Carbon Capture and Storage (CCS). The impact of catalysts, solvent and the structure of coal itself on the efficiency of the liquefaction processes are discussed. The use of coal to provide feedstocks and fuels is currently commercialised using gasification and the Fischer Tropsch process, but only in a couple of countries. As the authors note, it is only security of supply that will drive investment in these processes whilst the oil prices remain low. The chapter on CCS is surprisingly short considering the high value placed on its role in reducing emissions by the Intergovernmental Panel on Climate Change (IPCC). The three basic strategies for CCS are discussed, with the emphasis on capture rather than utilisation of the captured CO2. This chapter also briefly covers biomass with CO2 combustion and bio-CCS technology along with direct air removal of CO2, CO2 utilisation and enhanced oil recovery. The opportunities and problems for scale-up are considered but the technologies are currently lacking credible demonstration plants at scale, whilst governments have generally been pulling support from investing in research in these areas. This book is a timely addition to the Issues in Environmental Science and Technology series, particularly with the changes in the administration in the US. It includes chapters on all the main themes—mining, burning, health, regulation and carbon capture and storage. However, whilst some chapters are excellent and comprehensive without being dull, others would benefit from some severe editing as they are poorly written. There is also, in my opinion, too much emphasis on the US, with most of the focus of health, regulation and mining predominantly written with a US bias. With the increasing use of coal in India and China, a more balanced, global review would have been more fitting to the title. ‘Coal in the 21st Century’ is a slightly misleading title, as it is as much about coal in the 20th as 21st century. A recommended read though for anyone wanting a primer on coal as a source of energy, particularly those reviewing the potential of sustainable energies and IPCC emissions scenarios. Whilst coal is expected to be a part of the 21st Century energy supply mix, it would appear that the majority of the authors in the book think that this path comes with a high environmental price that is unlikely to be mitigated.